Sadler’s Wells’ annual dance taster festival Sadler’s Wells Sampled returns for 2019, featuring world-class performances and a series of workshops and activities on Friday 8 and Saturday 9 February. This collection featuring Mavin Khoo, Semperoper Ballett and Ramber2. The first exclusive opportunity to see the work of the inaugural Young Associates, a new Sadler’s Wells initiative aiming to celebrate and support young artists as they embark on their choreographic careers. Choreographers Anthony Matsena, Wilhelmina Ojanen, Ruby Portus and Christopher Thomas showcase the originality and innovative talent that distinguish them as ‘ones to watch’ in the dance world. Sadler’s Wells starts the new year with the return of the dance taster festival Sadler’s Wells Sampled. A regular fixture at Sadler’s Wells since 2007, Sampled features a wide variety of dance, from classical ballet to hip hop, contemporary and flamenco. Established in 2014 the Elixer Festival is a unique event celebrating the lifelong creativity and the contribution of older artists. It was set up to recognise the contribution these experienced artists make and challenge assumptions about what older people can and want to do. It features five days of performances, workshops and events throughout the theatre. Home Turf is a compelling collaboration between West Ham United Foundation, Sadler’s Wells Theatre and a team of over 100 professional and non-professional dancers, including West Ham United Foundation participants, Company of Elders and alumni of the National Youth Dance Company. The work is uniquely reflective of the diverse cast, united through football and dance. A team of international choreographers have worked collaboratively to create a thought provoking piece of dance theatre, exploring the highs and lows of football and of life itself. These photographs are of the initial workshop led by choreographer/teacher Joseph Toonga with students from Sir William Borlase’s Grammar School in Marlow, Berks. Big Dance Tea dance with a twist. 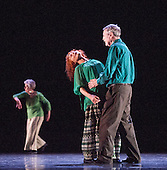 The afternoon featured dance developed with All Change and Candoco Dance Company, along with a Charleston dance workshop, and music covering everything from 1940s waltzes and lindy hopping to reggae, funk and big band. 28/06/2014. London, UK. Playlist: a weekend of dance diversity, offering a taster of the best of Sadler’s Wells taken from the programme SAMPLED. Zoo Nation with excerpt from New Work. As part of Big Dance Pledge, Sadler's Wells' Company of Elders, dancer from Scottish Ballet and 14 young dancers from English National Ballet's youth dance company combine to perform a pre-show pledge dance in the main foyer of the Sadler’s Wells Theatre, before a performance by Scottish Ballet. 08/06/2013. Sadler's Wells Theatre present Riot Company with 'Riot Offspring'. Riot Company is a collaborative community dance project, supported by Sadler's Wells Associate Artists and choreographers. It features over 100 performers from across generations, including menders of Inspire!, Mimbre Youth Company, and Company of Elders.